Dried Fruit and Sugar: Would You Eat 180 Grapes? 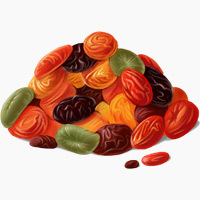 Dried fruit is a healthy-snack staple, especially for kids. Mini-boxes of raisins are easy to throw into a lunchbox, fruit leather is easy and fun, and it’s easy to feel good about: you’re feeding your kid fruit, right? What could possibly be wrong with that? For the grown-up crowd, dried fruit also makes an appearance on top of salads, in bowls of breakfast cereal, in trail mix with nuts and other goodies, and as plain as a snack for some quick energy. Try to imagine eating 180 grapes as a “snack.” You’d get sick to your stomach and stop before you got halfway through. But you could very easily eat those 180 grapes as raisins. A regular box of raisins is 1.5 ounces, which is approximately 90 raisins. A grown-up could easily eat two boxes (or more) of raisins at a sitting. That’s 180 raisins – all the sugar from the 180 grapes they came from – as a fairly small snack that probably won’t even keep you full for long. One raw banana is a satisfying snack, but if you’re eating banana chips, you could easily crunch through two or more before you feel full. The high amount of sugar in dried fruit may be particularly problematic for people with a FODMAP intolerance, fructose malabsorption, or other digestive problems, because it just concentrates the carbohydrates causing the problem. Dried fruit can also prolong sugar cravings if you keep eating it as a substitute for the junk food you really want. If you keep giving your brain and body sugar as a quick-fix for a bad mood or boredom, you’ll keep craving it. Comfort-eating dried fruit or trail mix only drags out the process of finding another way to manage those emotions; it’s much easier in the long run to rip off the band-aid all at once. It doesn’t matter. It’s still sugar. But Fruit has Vitamins and Minerals! And Fiber! Yes, it does have vitamins and minerals – lots of them, actually. But the dehydration process didn’t put them there; you can get plenty of them from eating the fruit in its original, non-dried form. As for fiber: the fiber and water in whole fruit are beneficial because they add sugar-free bulk, which helps make you feel full before you get an overload of sugar. With dried fruit, the bulk is gone. Fiber also has a delayed-action effect on fullness once it gets to the gut, but that process takes a while, and experience shows that most people can eat through a lot of dried fruit before it happens. Fiber also has other health benefits, but you don’t have to eat dried fruit to get it; fresh fruit and vegetables are just as good. So Dried Fruit is Bad? Not necessarily. The point isn’t that dried fruit is “bad,” just that it’s very high in sugar and ought to be treated accordingly. 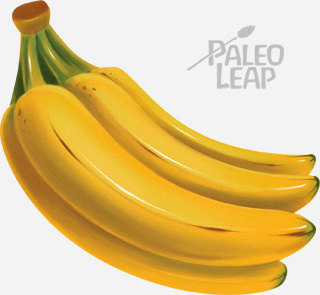 Just like other Paleo sweeteners (honey, maple syrup…), it has a place, as long as you know how much sugar it actually contains and plan your diet based on that, not on some vague assumption that it’s fruit, so it must be healthy. As a salad topping, for flavor and texture. As one ingredient in a trail mix that also includes lower-sugar options like nuts and unsweetened coconut flakes. As an ingredient in savory recipes, like this lamb stew. There’s also nothing wrong with eating dried fruit on its own as a treat or a dessert once in a while – just don’t treat it as a meal replacement unless it’s truly a dire emergency and your choices are a bag of raisins or a bag of Cheetos. The point is to make choices that reduce your need to consciously control your sugar intake. You could carefully measure out portion-controlled amounts of raisins every day for lunch, but that takes effort and it’s prone to human error. It’s much easier to change the way you treat dried fruit in general, so that it becomes a habit to use it in a healthy way (on top of salads, as an occasional treat) and not as a large component of everyday meals. Natural sugar is still sugar. Sugar that comes packaged with vitamins and minerals is still sugar. And dried fruit is pretty high in sugar, as Paleo foods go. It’s far from the worst thing you could be eating, but it’s also far from the most nutritious. To get the flavor without all the sugar, try dried fruit as a flavor punch on top of salads, or used sparingly in other applications. It’s not so great as a meal replacement (e.g. fruit and nut bars), especially if it’s every day. Too much dried fruit can easily stall weight loss, not to mention causing digestive trouble in people who have sensitivities to various different types of carbohydrates. Everyone has a different tolerance for sugar, so some people will be able to eat more or less dried fruit without causing any issues. And some people may feel better with it out of their diet altogether. It’s not “bad,” and if you enjoy it, there’s nothing wrong with eating it – just remember the sugar content and plan your consumption accordingly.